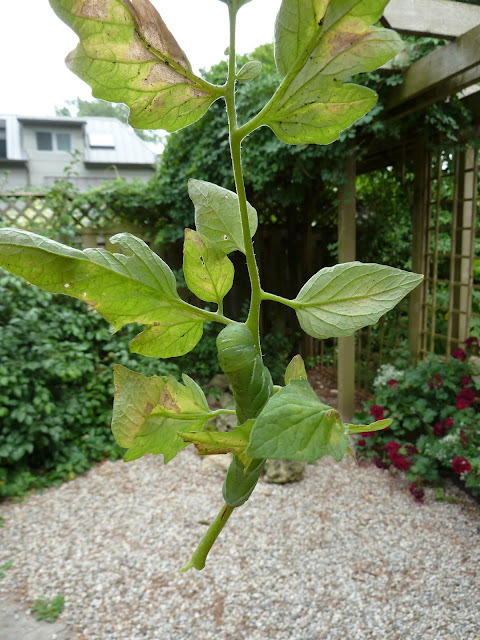 Looking out into the garden when I spied my tomato plant looking a little bare. Stems stripped. Tomatoes half eaten. This is my Mighty 'Mato broken at the knees, bald, and definitely worse for wear. Who would do such a thing? The displaced raccoon that Bart barks at every morning? Or could it be something else. Perhaps slower. Perhaps hungrier. Maybe something that is so clever that it is exactly the same colour as its dinner. Do you see what I see? There it was - and almost the exact size of Bart when he was a puppy. 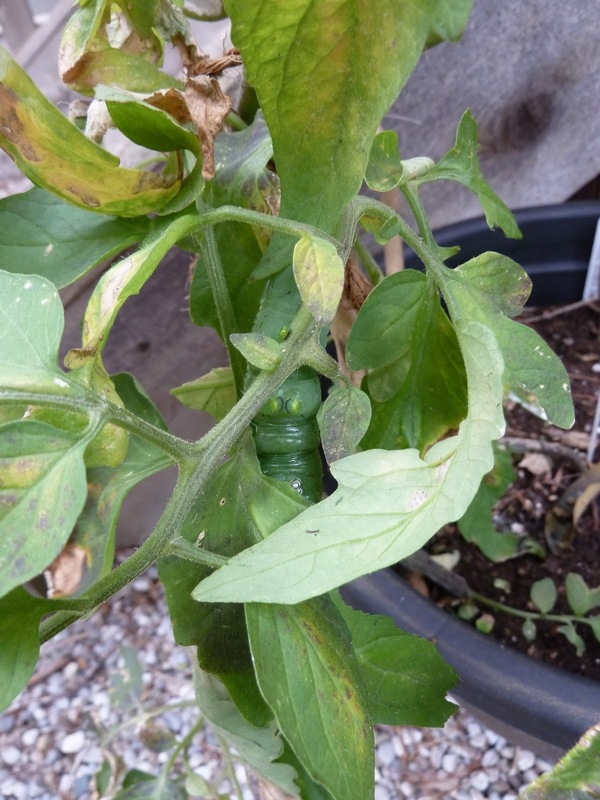 While you might guess that this is a tomato hornworm because that's where I found him at the buffet. 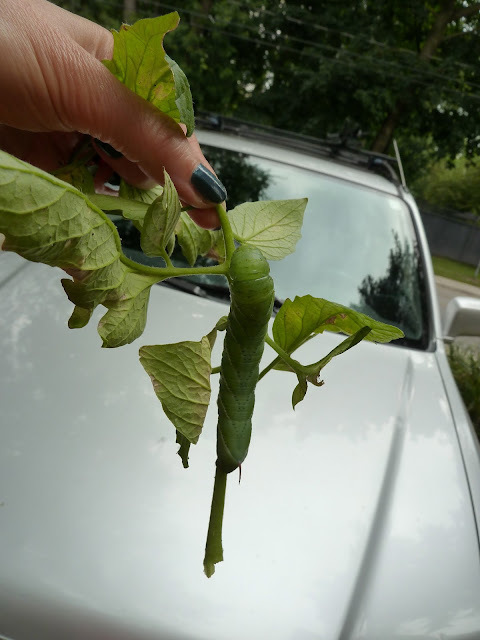 You'd be wrong - he's a tobacco hornworm. Fortunately their likes are similar, adoring plants from the solanaceae family. The difference is the tobacco hornworm has a red horn and seven stripes - the tomato hornworm has 8 triangle markings and a black horn. Hornworms are among the largest caterpillars found in North America (Garden Insects of North America) and this one I'm certain weighed about the same as a small basket of tomatoes - the tomatoes I was hoping to enjoy later this summer. Considering they're almost as big as a chipmunk, you really have to admire they way they blend in. Green is the new black obviously. And then a quick drop into the compost and fold over of the bag - enough dinner to keep him going - and hopefully enough heat where he's going so we won't see him ever again. That is quite a caterpillar! I have seen one only once and it was not as big as that. However I regularly see Hummingbird moths(the adult stage). I suppose they feed on several things. I love your sense of humour in the face of this little garden disaster. Good tomatoes are hard to come by. Even the ones at the local farmer's market seem to be more generic tasteless variety. I also admire your camera work. 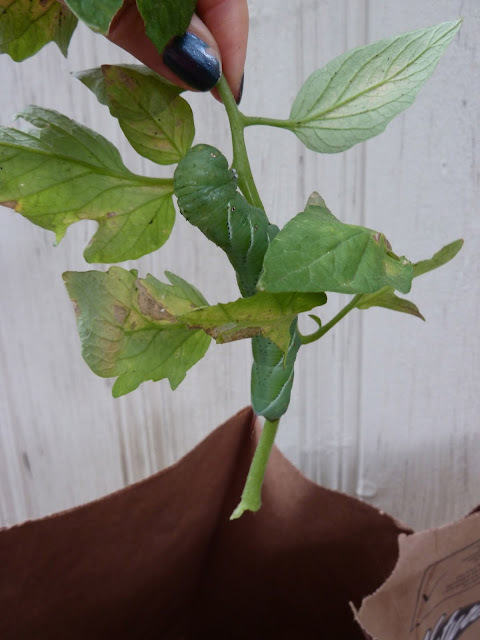 How did you manage to grasp the tomato stem with the hornworm, get Bart to pose and hold a camera? I love the quizzical look on Bart's face. 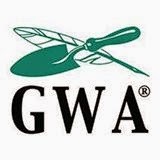 You must be getting ready for the big GWA conference. Have a great time!! I look forward to seeing the pictures. Alain, if you see the moths, those little eggs are somewhere - was quite surprised and a little less than delighted to find two brutes eating their way through my tomatoes. And you're right, just as long as they are in the tomato family - peppers, tomatoes, etc. they are more than happy to spend time eating their way through your harvest. Jennifer, Oh I was soooooo cranky when I realized what the little beast had done - but in the great scheme of things and after lifting it up and realizing how much it must weigh - I was more than impressed - no teenage boy could eat as much. The secret to the camera work is having the camera tied to my hand whenever I'm in the garden and having a terrier - they're really interested in anything you are interested in - St. Bernards not so much - also it's just a good point-and shoot so I don't need to do any serious lifting, holding and steadying. Hopefully much prettier photos of flowers and rivers and fewer big green bugs in the days ahead. I have just come across your site barbarasgardenchronicles.blogspot.com and would be really interested in chatting to you further about some advertising opportunities and partnerships that would be mutually beneficial for us. I think most gardeners experience all seven deadly sins in the garden every year. You treated your caterpillar friend to a nice demise, surrounded by all that yard waste!